Float Therapy provides the optimal environment for mind and body total relaxation. Relax the body and the mind will follow. The tank is an enclosed shallow pool of warm water (93.5° skin temperature). The water has 35% density in Epsom salts (800 pounds), allowing the body to float effortlessly. Free from gravity's pull, the body can release tension, easing pains and stress - often relieving long -held pain. The Epsom salt water draws toxins from the body and can ease inflammation that causes soreness in muscles and joints. The relaxing effects of freely floating allows for a meditative state conducive for exploring deeper levels of consciousness. This deep state of relaxation reduces stress, promotes clearer thinking, stimulates creativity and enhances learning. Although the effects of a single float may be powerful and long lasting, if you establish a routine, the effects can become cumulative. The body/mind quickly adapts to the unique tank environment, so in subsequent floats you go deeper, faster, experiencing enhanced benefits. Without having to work at it, one learns to release physical and mental tension and to establish that balanced state in one's life. We encourage subsequent visits to fully realize the benefits. Please note that the float tank is NOT Handicap Accessible. If you have any questions please call and discuss with us before scheduling an appointment. Q. How should I prepare for my float visit? A: We recommend to eat very lightly to avoid being hungry yet not too full. Limit drinking beverages since this could interrupt your float time. Avoid caffeinated beverages which would interfere with relaxation. Q. How much time should I allow for the float session? 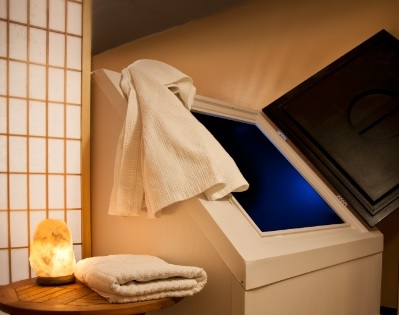 A: Our float sessions are for 90 minute which is your time in the float tank itself. Every client must shower for a good five minutes before entering the tank and will shower after to remove salt. We allow an additional 30 minutes for your private use of the attached bathroom for this reason. New float clients need to arrive 20 minutes before first float for intake registration and orientation. A: Just yourself! We provide all that you need to float - toiletries for the shower before and after, towels, earplugs and CD music. You can bring personal toiletries to use after floating and CD music if you wish. Q: Don't I need a swimsuit? A: No. The tank room is private. The swimsuit would not only be restrictive for you but also may bring contaminants into the tank so we do not allow swimsuits. Q: How is the tank cleaned and maintained? A: The tank is cleaned after every floatation session by pumping the water through a filter, which removes any particles. At the same time, an ozonator is running which creates ozone, an oxidizer that destroys water contaminants as effectively as chlorine or other disinfectants. At the end of the day, we use a food grade hydrogen peroxide, which acts like chlorine without chemical residue, to further sterilize the tank. Additionally, Epsom salt is a natural cleanser that kills bacteria. Q: Can I float if I have a small cut? A: Small cuts and scrapes may sting for a moment when entering the water, but that should quickly subside. If you have a large cut or scrape, then we recommend you wait until it's healed before floating. Since abraded skin can be salt sensitive, we recommend not shaving the day of your float. A: The Wellness Center keeps a Credit Card on file to hold your first Float appointment. It will not be charged until after the service. You may cancel or reschedule up to 24 hours before the appointment, but will be charged the full amount for a no-show. Q: Will I be enclosed in the tank? A: Yes, the tank is a closed, comfortable environment where you are totally in charge of coming and going. The door to the tank easily opens with a one-finger push. You can choose to float with lights on or off. Air is constantly circulating through a vent near the top. Since you are more above the water, keeping the door closed maintains a warmer environment for floating. Q. Can I have a massage with a float? A. We whole-heartedly recommend floating before a massage. The relaxing float experience aided by the epsom salts, helps release muscle tension, allowing for a deeper, more effective massage. Especially good for the muscle-bound or extra tight tissue. We do not allow floating after the massage since the massage oils used can persist and cause a problem in the tank filter. Q: How many float tanks do you have? Can more than 1 person float at a time? A: We have 1 tank and so only 1 person can float at a time. Only 1 person can fit in the tank comfortably. Float appointments may be scheduled back to back. Q: When should I NOT float? -Clients with limited mobility/physical disabilities may not be able to use the tank and should assess the situation beforehand. A person needs to be able to get into and out of the tank by themselves without assistance, for safety reasons. A: Please call us to ask!